2014…really!? I so vividly remember the whole Y2K scare…and now here we are already 14 years later. I know we say it all. the. time. But seriously…life zooooooooms by, doesn’t it? I guess that’s why I’m feeling a big urge to LIVE LIFE NOW. Because, time keeps on flying. Last year, my mantra for 2013 was the Ralph Waldo Emerson quote, “Wherever you go, go with your whole heart.” And man, that intention sure came to fruition when I gave birth to my sweet baby Grayson in September. This year I definitely will carry the intention of opening my heart more and more. And the words I’m really drawn to in this moment are meditation and mindful action. I’ve been reading Pema Chodron’s lovely book, When Things Fall Apart, and she reminds us to stop filling up all the spaces. It’s in the space – the quiet, the stillness – where we really learn about our life and ourselves. Yet, so often we fill up that space before we ever hear the quiet. We stay busy. And it’s that busyness that keeps us out of touch and disconnected to our real purpose in life. As I continue on my life’s path in 2014, I am setting an intention to meditate more often, to stop filling up all the spaces, and to walk forward taking mindful action along the way. It’s hard to really know what you need when you never stop to listen. Make space in your daily life to get quiet. It might be taking a few moments before you get up for the day or during the quiet time of night right before bed. Close your eyes and take a few deep breaths in and out. Feel the tension release from your body. Softly smile. Let your thoughts float in and out, as though they were clouds. And simply sit in the stillness. Pay attention to the words or phrases that speak to you. Listen to the messages of your heart. Writing in a journal helps you clear the chatter in your mind. It also gives your inner most thoughts a safe place to go. Writing your thoughts, feelings and dreams help you sift through and decipher what sometimes feel utterly confusing. When you journal, write from the heart, without editing, and see what comes out. If you feel blocked and don’t know what to write, simply start with writing how you feel about the day. Keep your pen moving. It’s helpful to read your journal posts several days later to gain clarity about your true feelings. Taking the time to write helps bring you in touch with what needs your attention. Creativity is one great way to reconnect to your intuition. And it’s there, your intuition, that guides you on your path in life. When you feed your creative spirit through playful art, you remember that there is no right or wrong way to be creative. It’s about the process of stepping into the flow that comes from being creative. Making art, without rules or desired outcomes, allows you to let go of perfect, embrace messy and play – which all help you step outside of your critical mind and into your loving heart. Making art and expressing your creativity gives you the courage needed to listen to, trust and follow your intuition. Getting honest with what isn’t working in your life allows you to awaken. Rather than numbing or stuffing or denying your true feelings, it’s time to see your life in this very moment. What are the repeated patterns you notice in your life? (Journaling helps you discover this, too.) What frustrates you? What do you find yourself complaining about regularly? Pay attention to the things that aren’t working out so well right now – relationships, work-life balance, finances, personal health, food habits etc. What are you ready to let go of so that you can make space for a better life? When you are clear about what isn’t working in your life you can get clear about what changes you need to make. It’s so easy to focus on what we don’t have and then we miss seeing and fully experiencing what we do have. Become more aware of what you are thankful for every day. Starting a gratitude practice cultivates loving kindness towards others and to yourself. When your intentions come from a place of kindness, you know they are true. Celebrating your life as it IS in this very moment allows you to be more open and receptive to where you are being guided to next. Getting quiet, journaling, making art, being honest about what isn’t working and celebrating what IS will help you become more aware of the inner voice that is sending you authentic messages to follow. Rather than jumping into the next diet craze, or setting unrealistic goals to workout 10 times a week, or resolving to never eat sweets again, creating New Year’s intentions from the guidance of your intuition, will set you on a course where you feel the inner motivation, inspiration and excitement that comes from living the life you are meant to live. 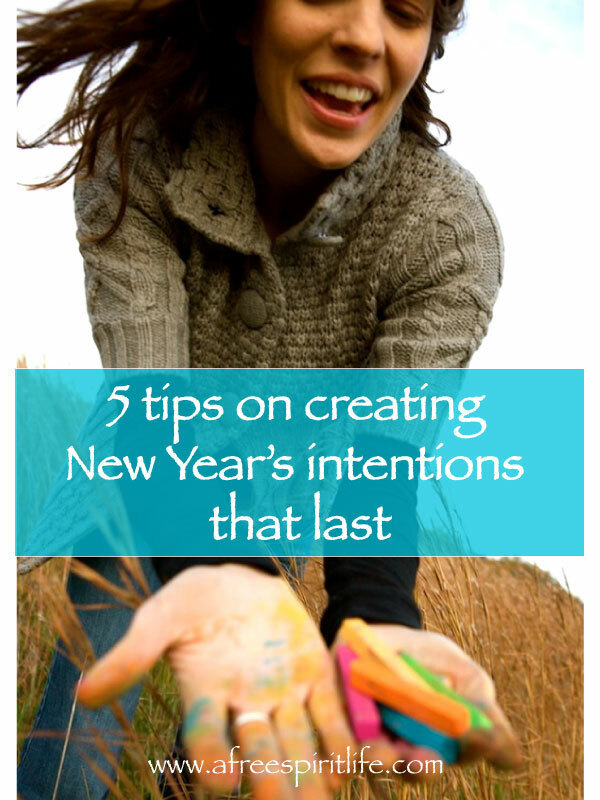 And living in-line with your authentic way of being will make your intentions last way beyond the New Year! Play and laugh a lot. Wishing you a New Year full of adventure and happiness! Now is your time to live a life you love. Registration for Inside Out: A Creative Adventure of Self-Discovery is now open.